Fall is a great time to have a wedding, and choosing a fall wedding idea can be a lot of fun. In many parts of the country the bright colors of fall foliage offer the perfect backdrop for your wedding. Listed below are some ideas to get you started with your planning. There is a lot of information here, so you may want to bookmark this page so you can easily return in the future. Any outdoor location can be the perfect option for a fall wedding idea. These include tented affairs on estates and vineyards, Inns and Bed and Breakfasts, barns and any other location that allows you to enjoy the foliage that fall brings. Indoor locations can also work well of course. Any type of hall or other reception space can be decorated to match your other fall wedding ideas. Even if you are getting married indoors, you may want to still have photos taken outdoors surrounded by the seasonal foliage. Look for outdoor spots at your reception space, or look for nearby parks that you can stop by on the way to the reception. Starting with fall wedding invitations or autumn themed wedding invitations, you have the opportunity to introduce your wedding theme to your guests. Look for invitations that have fall designs, leaves, harvest and foliage colors. Another example is vineyard wedding invitations, which ties in a vineyard or winery theme. Fall wedding programs let your wedding guests know what to expect during your autumn wedding ceremony. Try to match them with your invitations and the rest of your wedding day colors and decorations. Having your wedding ceremony outside is definitely an option for a fall wedding idea. Exchange your vows in a garden under a wedding arch for a festive autumn ceremony. Decorate your reception with deep reds, oranges and auburns to match the colors of the fall season. Candy apples are a fun way to tie a childhood favorite into your wedding. The candy apples of today are not the boring ones you might have had as a kid. Candy apples can be used to hold seating cards which can double as favors. You could also put several in the middle of the reception tables as part of your centerpieces. 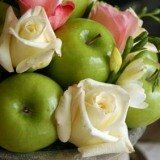 Have your florist use red or green apples and pears in your flower arrangements. Apple martinis make an excellent signature drink for your fall wedding. Carry the theme into your invitations, programs and thank you cards by choosing designs that include apples. Gather a few trash bags full of leaves of all different colors, and use them to cover the aisle where you will be walking during the ceremony. This works great for outdoor weddings, and some churches may allow this as well. You can also use the colorful leaves as part of the centerpieces on the reception tables. For the invitations and programs, choose leaf themes. Many designers also have paper that is shaped like a leaf that they use for invitations and programs. Gold dipped leaves make an elegant wedding favor that is perfect for the fall season. Instead of a traditional guest book, have a tree (either real or wire) available along with paper leaves and pens. Guests can write their well wishes on the leaves and hang them on the branches. Have a tented fall wedding idea wedding at a vineyard or winery. Many vineyards have Inns or areas for tents, and you can usually get a great deal on their wine. Create custom labeled wines for your wedding party and guests. There are other wine related wedding favors to choose from including corkscrews and wine charms. Corks can be used as place card holders. Have your florist use extra large wine glasses instead of vases for your centerpieces. Put several of your favorite wine choices on the tables for the reception. Have the caterer pair wine with each course of the reception meal. For more ideas visit vineyard wedding theme and vineyard wedding invitations. Use small, relief carved pumpkins with table numbers as centerpieces along with seasonal flowers. Or, use jack-o-lanterns as your centerpieces lit up with candles. You can also put larger jack-o-lanterns on the seating card table so guests see them as they enter the reception. Gourds are another fall season favorite for centerpieces and other decorations. They look great with leaves and other fall flowers. Tie pumpkin into your menu by offering pumpkin soup and pumpkin pie as dessert. Small carved pumpkins can also be used as favors with a pumpkin spiced candle. As with the other fall themes, tie pumpkins into your invitations and programs. 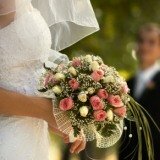 There are many great fall wedding flowers to choose from for your wedding. Options include hydrangea, chrysanthemum and different shades of rose among others. Sunflowers and garden wedding flowers also work really well in autumn. Fall wedding arrangements can be used to brighten up your ceremony, reception and all aspects of your wedding day. Autumn offers many great flowers and accent items that can be used in centerpieces. Visit fall wedding centerpieces to see photos and get ideas. Your fall wedding cake is an area of your fall wedding idea planning that you can have some fun. Use accent items on your cake like fall leaves and flowers. You can also change it up a little and go with a fall cake flavor, like spice or pumpkin, and you can top it off with a fall wedding cake topper. Halloween Wedding Cake is a must visit if you are having a fall Halloween wedding. There are some great options for fall wedding favors. Visit autumn wedding favor for ideas.